1. Preheat the oven to 200°C, gas mark 6. 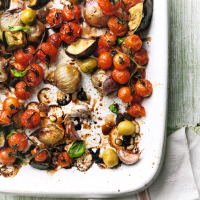 Place the whole shallots, aubergine, garlic cloves and cherry tomatoes in a roasting tin and mix in the oil. Roast for 45 minutes or until all the vegetables are tender and lightly browned. 2. Stir in the balsamic vinegar, toasted pine nuts, sultanas, stuf ed olives and basil leaves. Serve while still warm or at room temperature if you prefer.